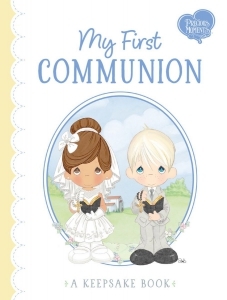 This keepsake gift book, created with the iconic style and characters of Precious Moments, celebrates the occasion of a child's First Holy Communion. Complete with fill-in pages and prompts to personalise the book, as well as prayers and thoughts on living as a Christian, this keepsake book will preserve this special moment in his or her faith journey. Treasure this special moment in a child's next step in his or her faith.